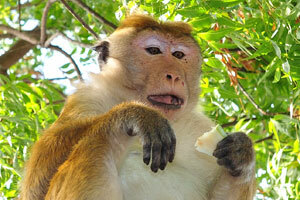 The toque macaque “Macaca sinica opisthomelas”. 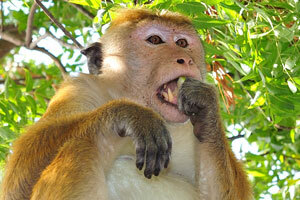 The toque macaque is a reddish-brown-coloured Old World monkey endemic to Sri Lanka. 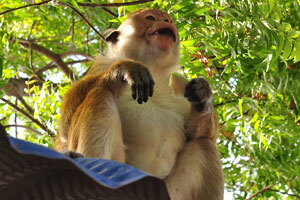 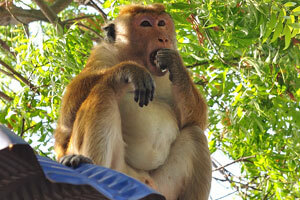 A toque macaque is eating a guava slice on a roof. 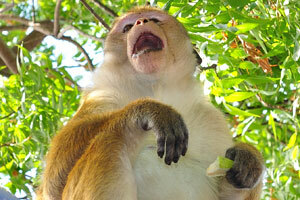 The toque macaque “Macaca sinica opisthomelas” has huge teeth. 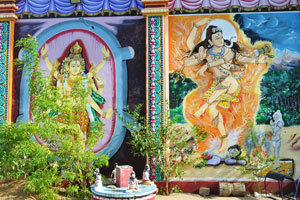 Thematic paintings adorn walls of Koneswaram Temple. 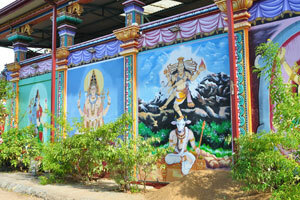 A wall of Koneswaram Temple. 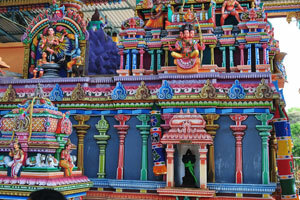 A black deity is inside the temple. 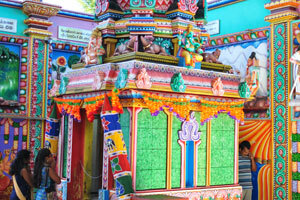 The colorful interior of Koneswaram Temple. 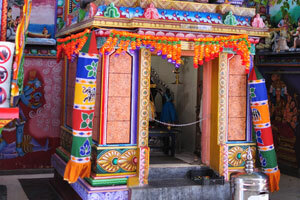 Sacred boxes are in the courtyard. 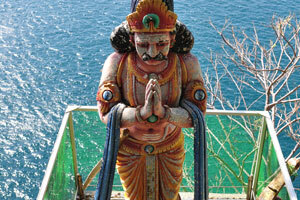 A statue of a man. 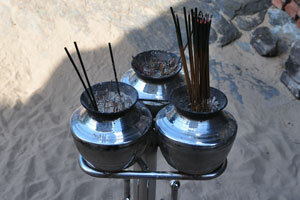 Thin lighted candles with incense. 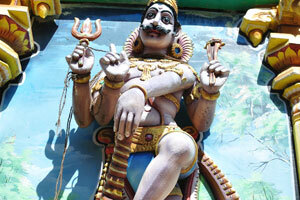 A black statue of a sacred cow. 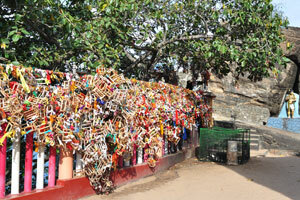 The decoration of the main gates. 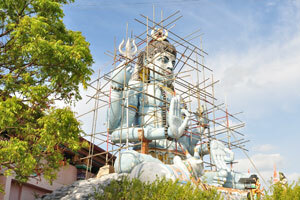 The statue of Lord Shiva is in the process of reconstruction in 2018. 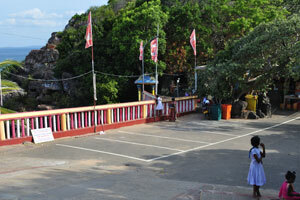 This area is in front of the temple. 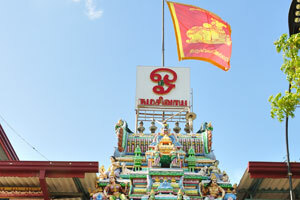 The main view of the temple. 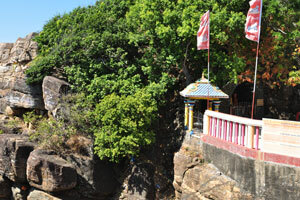 The temple buildings are on the top of the cliff. 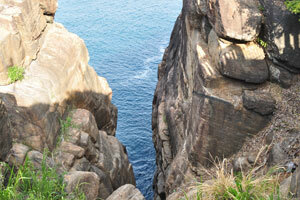 Ravana's Cleft as seen from the top. 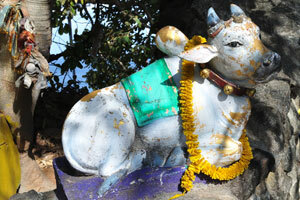 A statue of a sacred cow. 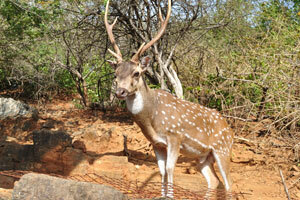 A Sri Lankan axis deer. 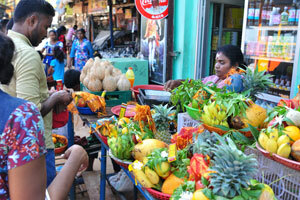 A female vendor sells temple offerings. 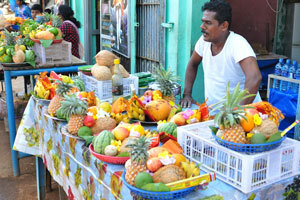 A male vendor sells temple offerings. 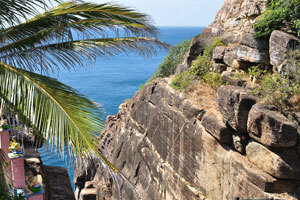 The wall of the cliff features different religious stories. 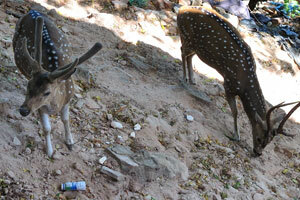 A couple of Sri Lankan axis deers. 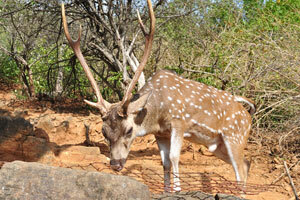 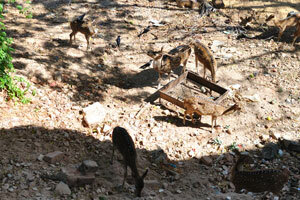 A herd of Sri Lankan axis deers. 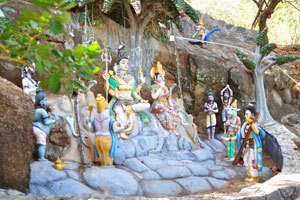 The wall of the cliff features bright religious characters. 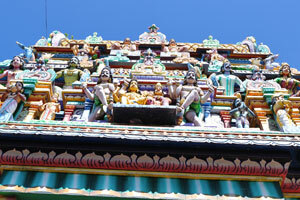 The facade of Koneswaram Temple. 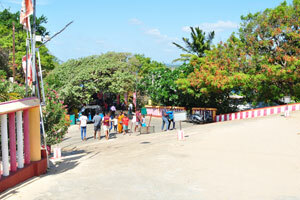 The wide stairs of the temple. 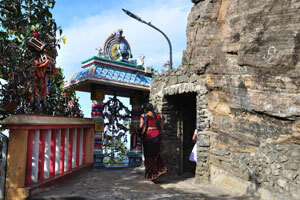 Side entrance to Koneswaram Temple. 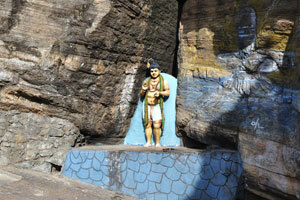 The Ravana statue is located on the east side of the rock slope. 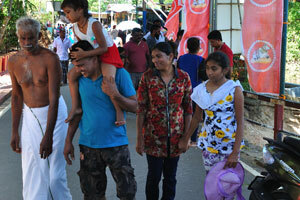 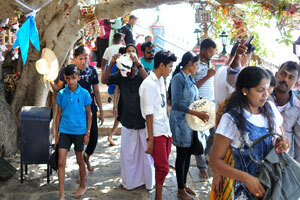 People walk beside the Ravana statue. 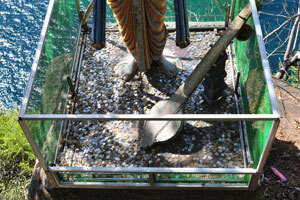 Coins are scattered around the feet of the Ravana statue. 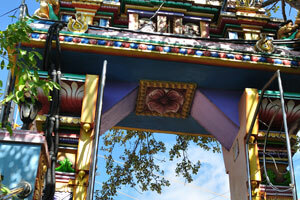 The decorated gateway leads to the Koneswaram idol. 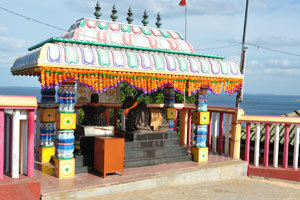 This temple is a classical-medieval Hindu temple dedicated to Lord Shiva. 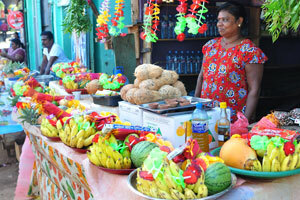 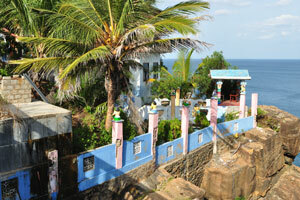 Koneswaram holds a significant role in the religious and cultural history of Sri Lanka. 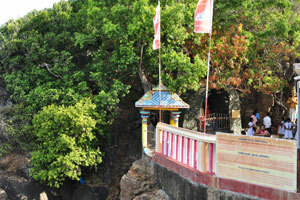 Koneswaram was built during the reign of the early Cholas and the Five Dravidians. 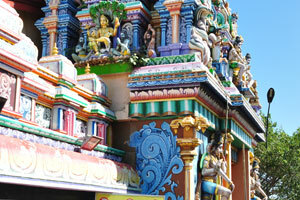 Koneswaram Temple is one of three major Hindu shrines. 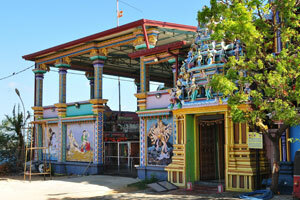 In line with custom of Tamil Hindu temple compounds, the complex houses shrines to several deities. 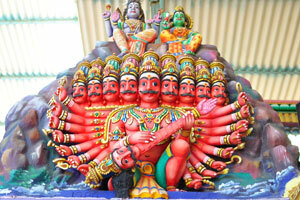 Iconography of Ravana, the mythical king of Lanka depicted inside the temple. 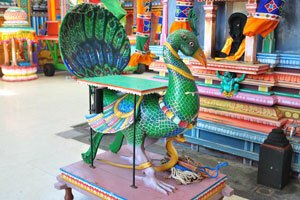 A peacock statue is inside the temple. 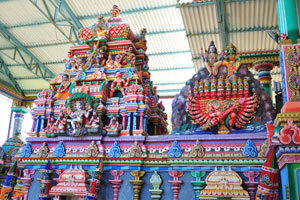 Hindu followers are inside the temple. 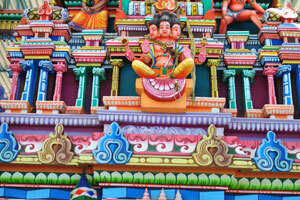 Koneswaram Temple is located on the promontory with a colossal gopuram tower. 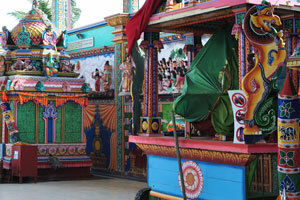 A gazebo is placed over Ravana's Cleft. 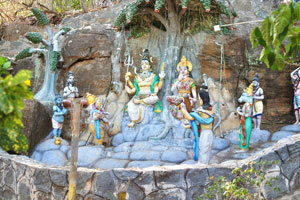 Hindu followers are near the temple.